Circumstances of injuries: The unusually nice weather encouraged me to clean the leaves from the gutters on the garage. This hadn’t been done in several years so there was a large accumulation of dead leaves and rotted mulch in addition to the fresh leaves from this year. As a result it was necessary to climb the ladder and use a hand trowel to dig the muck out of the gutter. Griffin thinks there might be mice hiding in the gutters. I am unused to using ladders and have somewhat of a fear of heights so this task was taking an extraordinary amount of my concentration to complete. 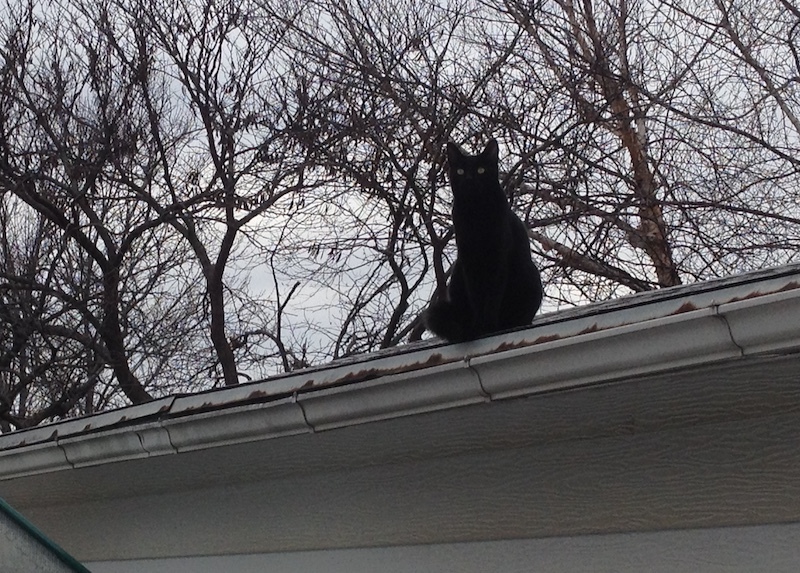 Since my attention was focused on digging in the muck I did not notice that my black cat Griffin had climbed up on the roof and was innately curious as to what I was doing. At the point he had approached within a few inches of my work I looked up and started, I attempted to step back and fell off the ladder. My fall was broken by a dogwood bush growing next to the garage. The cat wandered off refusing to stop and render aid.